In the United States our presidential elections are based on the electoral college system -- which is an electoral college based system which has been in place for every Presidential Election in U.S. History. Each state is assigned a point value or number of electoral votes based on its population. While the actual number for each may shift from cycle to cycle, the total number of electors is always 538. To win on election day - Tuesday, November 8th - a candidate must capture at least 270 votes of the 538 votes. In the event of a tie (269 to 269), the House of Representatives selects the next President of the United States. We also tally the Popular Vote in each state, which is the gross individual vote total for each candidate. The electoral vote is the ultimate decider, but the popular vote provides the detailed breakdown and voter demographics essential to the election analysis. While the two usually go hand in hand, there have been historic exceptions, including the contested 2000 Presidential election where Democratic nominee Al Gore won the Popular Vote with 48.4% to George W. Bush's 47.9%, but technically (and officially, per the Supreme Court) Bush won the election with 271 electoral votes. 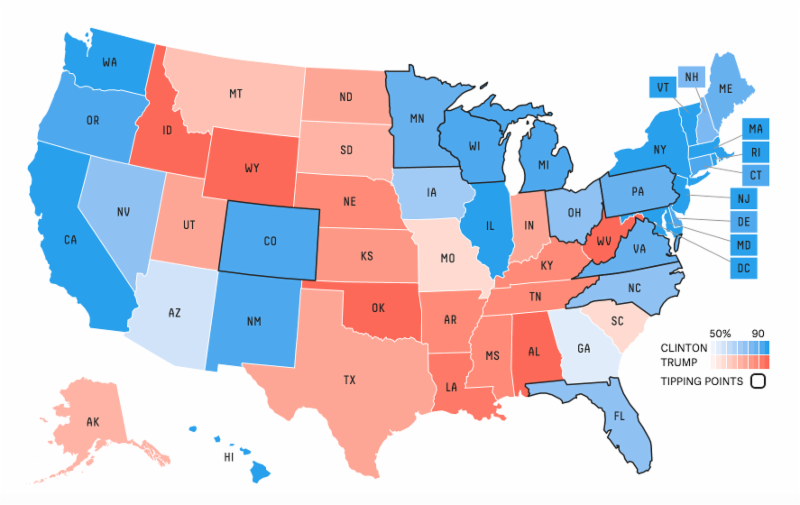 For the daily polling count on where the votes stand, check out FiveThirtyEight's interactive map, which compiles all state and national polling data using grades assigned to each pollster based on past accuracy. The map you see is the visual version of the entire data set, eventually predicting not only a winner, but also an electoral college and popular vote margin of victory.